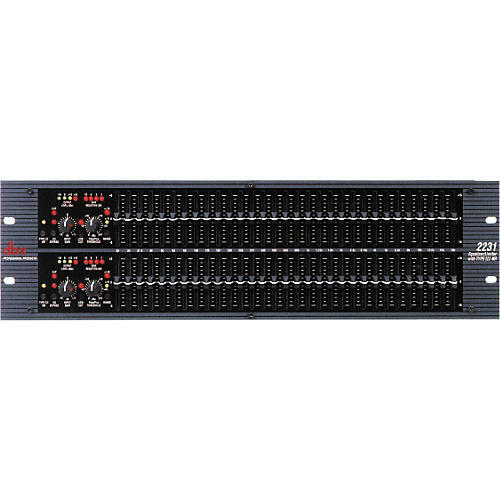 The dbx 2231 Graphic Equalizer is the stereo version of the dbx 2031 EQ. Combines a superb EQ circuit, a powerful limiter, and revolutionary Type III noise reduction that increases S/N ratio by 20dB. PeakPlus limiter's threshold ranges from 0dBu to +20dBu and can transparently tame the wildest hits or subtlest nuances of any signal. 4-segment LED bar graph for both gain reduction and output level offers the most comprehensive visual feedback available. Also includes status LEDs for all settings on the front panel. XLR, barrier strip, and 1/4" connectors; 45mm nylon sliders; and 12dB input gain stage provide pro flexibility and performance. 4U rackmount. 2 year warranty for products purchased from us, with the exception of the 480 series.